Revetment walls built using ASP Piling’s precast panel system offer supreme protection from erosion. A revetment wall is a permanent structure designed to prevent the types of subsidence that commonly occur adjacent to waterways and the ocean. By definition, it is a protective covering on an embankment of earth designed to maintain the slope or to protect it from erosion. Revetment walls are built to local council requirements along the council’s revetment regulation line which is determined by a waterways search. In general, property owners are responsible for maintaining revetment walls that benefit their land. Like all structures, a revetment wall has an engineered design life and requires regular and proper maintenance to prevent structural deterioration. Preventative maintenance including routine inspections by a suitably qualified engineer will extend the life of the wall and prevent premature structural failure. The Revetment Wall System employed by ASP uses pre-cast concrete panels for a durable and highly efficient build in locations throughout Australia. Steel sheet piling is driven in the water area parallel to and beyond the proposed revetment regulation line and dewatering used to prepare the line for installation of the wall panels. The line is then surveyed ready for panel installation. High quality interlocking pre-cast panels are positioned through the use of a guiding rig and are driven into position by means of water jetted through pipes running internally through the length of the panel. Once the panel has been jetted into position, the water jet head is detached and the guiding rig is repositioned for the driving of the next panel. Once the revetment wall is in place and the rock or scour protection is in place, the steel sheet piles are then removed, allowing the concrete wall to function correctly along the revetment regulation line. Efficient: Pre-cast panels ensure better quality control than poured in place systems or rock wall structures due to the rigours of the marine environment. Quick: Pre-cast Revetment Wall Systems can be installed efficiently with various ranges and sizes available. 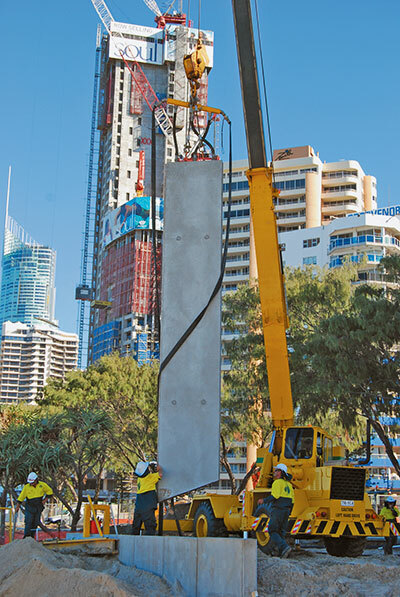 Installing a pre-cast concrete panel as part of revetment wall building for the Surfers Paradise Foreshore Redevelopment. ASP Piling revetment wall construction is available throughout Queensland, and in NSW and the ACT.